What did everyone do before Netflix?! These days I'm finding myself watching Netflix more than I watch actual TV (apart from my beloved Bake Off of course! 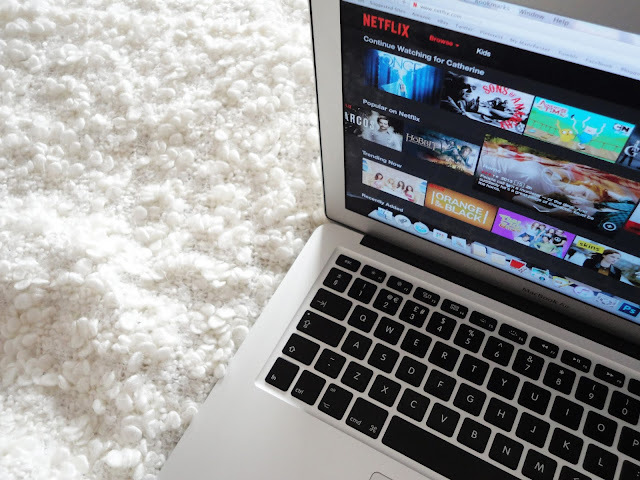 ), and so today I thought I'd share my favourite things to watch on Netflix, so if you're stuck with what to watch (there's so much choice it can be overwhelming! ), hopefully these recommendations can help. I saw this kind of post on Corrie's blog, and thought it would be a nice idea to share my favourite shows too, so let me know your faves in the comments! Once Upon A Time - This is mine and my boyf's current obsession. It's a show based around fairytale characters and will feature pretty much every character you can think of! It has so many twists and turns and it is one of the best program's I've seen in ages. We have just finished Season 3, and Season 5 comes out this September, so you'll have plenty to catch up on! Gossip Girl - Probably my all time favourite show. I can't even count how many times I've seen Gossip Girl now, and I still never get bored of it. From obsessing over the outfits, to drooling over Chuck Bass/Nate Archibald to falling in love with NYC with every panoramic shot, it's easy to see why it's such a popular show. Again, there are so many twists and turns in every episode, and if you've managed to avoid huge spoilers online, then there'll be even more unexpected moments. House of Cards - This is one of those programs I never thought I'd like, but after finishing the third season in record time, I can wholeheartedly recommend it. It's based around the White House in Washington, with Frank Underwood and his wife Claire taking on the country. It's definitely not as light as the other programs I've mentioned, and does require a bit more concentration to watch (I can't be on my phone and watch this at the same time! ), but I loved it and already can't wait for the next season. Orange is the New Black - Everyone loves this show, and again, this is another one I never thought I'd like. Based in a US women's prison, it originally follows Piper Chapman as she enters the prison. It branches out to cover the history of each inmate and is a really interesting watch - with some funny bits too! I have to say, I didn't enjoy the third season as much as the first two, but still a good watch. 90210 - Another classic program that I loved watching when it was originally on TV. This is similar to Gossip Girl as it follows a group of friends throughout their time at high school and beyond, except this time it is set in sunny Beverly Hills. My absolute favourite character has to be Naomi. Much like Gossip Girl, there are also more serious topics covered, which makes the characters more relatable and interesting and also adds more drama. And if all else fails, I love the huge selection of comedy shows on Netflix. You can find Live at the Apollo, 8 out of 10 Cats and tons of standup shows so you'll never be lost with nothing to watch! Let me know your fave Netflix series' in the comments.